Weather: Sunny, high 11, low 10. Nobody expects the City to come through and actually start the ice making on time. 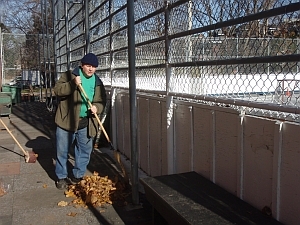 But today there was a surprise -- the rink was vacuumed clean of leaves. Tonight is still pretty warm, but after tomorrow, the temperature is supposed to dip down to freezing for a few nights. Is it possible that the City will actually send workers to flood the ice, and open on time? Weather: hazy, weak sun, high 11, low 0. 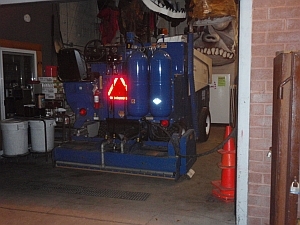 Rink compressors were turned on by technical services staff in the morning. Weather: high 4 low -6, sun and cloud. Two shifts are coming to flood -- the first two staff arrived around 5 p.m., plans to do four floods. The next two will arrive at midnight to do some more. The ice is freezing very fast (we did a test square with a bucket of water around 4.30 pm.). The crew is running the hoses straight out of the compressor room, presumably to make sure that no volunteers get their hands on the hoses and do additional unauthorized floods. The compressor room door has to stay open the whole time -- hopefully it's not too chilly for the compressors. 12.25 a.m. 2 staff were there.They said they would flood 5 times and work until 5am that night, but they both drove away in cars when I was leaving! 3.45 a.m. Ice starting to build up -- midnight-shift rink staff says they flooded twice so far, he wants to be careful that it doesn't go too fast and develop shell ice. The Harbourfront webcam shows a zamboni going around and around at this time. 12 noon: bright sunshine, temperature 5 celsius. Ice is holding but thin. 5.45 pm: the 5 pm shift arrived, two regular staff and one getting training for the flying squad. They insist that the rink will open tomorrow, the only one of the 14 rinks that's scheduled to open. But the ice is still very thin. Another double shift is booked tonight. 12.05 a.m.: signs of a recent flood. Still many thin patches. 10.45 a.m. The ice is thin but holding so far. With only two nights of flooding, it's unlikely the rink can stay open in the afternoon, since it's going to be 11 celsius and the sun's out. 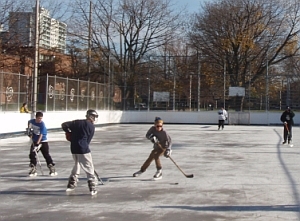 But for now, the ice is holding and the first rink rats have started up their long winter shinny game. The ice is covered by a thin sheet of water on the south-facing side, but at this time of year it doesn't turn into mush -- the only thing to watch out for is cement, but the skaters say it's fine for now. 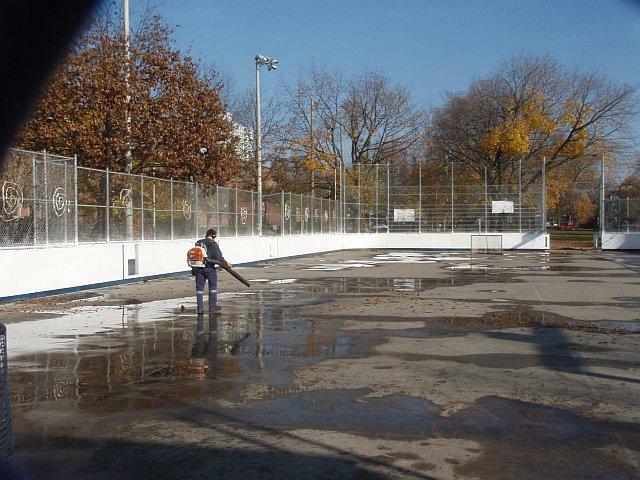 The rink got very wet and the ice was even thinner, so that it had to be closed by noon. The pleasure-skating side only was reopened at 8 pm and closed again at 8.45 so the zamboni could do ice repairs. 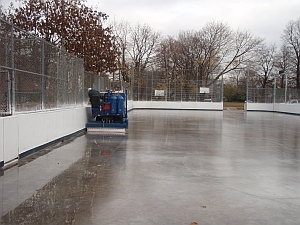 The zamboni driver stayed until 2 a.m. and did four more floods. He said he had to be careful that the machine didn't take out whole patches of ice. Three boys were accosted by two young men near the garage, and mugged for one of their cell phones. Everybody is on the lookout now. The rink was never able to open today. The surface was too wet and underneath was too thin, eventually hitting cement. After 8 pm, the zamboni driver laid down three hose floods. After that it was thin but there were no cement patches. 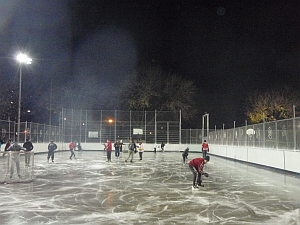 After midnight, a group of volunteers hosed the rink on the pleasure-skating side, as a test. It froze up very fast, so overnight the volunteers laid down another four floods (there was enough length of hose to do the whole pleasure-skating rink). Each time it froze very fast. The pleasure-skating side was fine this morning after the test flooding. The hockey side was very thin so it stayed closed until 6.45pm, with the zamboni driver laying down a flood almost every hour. The pleasure-skating side was shared-use between shinny and pleasure-skaters -- lots of people. It held up very well, and despite heavy use after the hockey side was opened, the hockey-side ice held up well too. It's evident from the test area that one additional night of hose floods on both sides would have meant the rink would not have had to close at all today, not on the hockey side either. High 1, low minus 1. Rain beginning around 7.30 pm. Ice maintenance: pre 9am, double scrape and flood, 11 am s+f, 1 pm s+f, 3 pm s+f, 6 pm s+f. Each time a whole tank of water on each side. After 7pm it started to rain heavily so no need to put more water on. The water froze right away, since there's already a good base layer of ice. The zamboni operator had to do a double shift because the seasonal operator wasn't recalled until tomorrow, and even then he'll be off doing training -- although he's been doing this same job for many years. 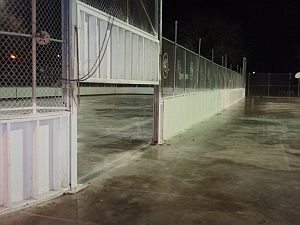 No women showed up for shinny hockey and the hockey players left at 10pm, due to the rain. 8.45 a.m. The ice is solid and in great condition. The rain last night added more thickness -- a good thing for now. Lots of skaters. Low -1 high plus 5, mostly cloudy. Good ice. 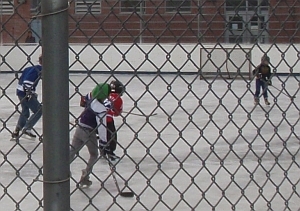 In the evening it was a bit chopped up because it was so crowded (20 on 20 for shinny hockey). The zamboni took it very fast -- hope they can slow down more so they get a bit more water in the cracks. The permit people said the ice was a bit rough. Low 5 high 10, thin cloud alternating with direct sun. The ice held much better than was expected, despite the warm sun. 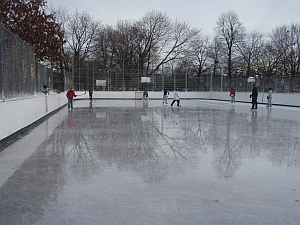 The rink was closed for six hours in the afternoon, covered with a layer of water but hard underneath. Very full of skaters all evening -- date night. No sun today at all, so the ice never even got wet on top, even though it went up to 13 celsius at one point. The rink got more crowded as the day wore on. At around 7 pm there was a fight outside the front doors, which ended with one of the youth (they were a largish group of maybe Tibetan youth) kicked a hole in the glass panel on the front door. Police came quickly, and Security came as well -- not sure if they nabbed anybody (the staff thought the group went over to the KFC across the street). Some of the familiar skaters from last year are arriving back as they figure out that the rink is open. One woman said, "I know that there's lots of trouble here at the park, with the bureaucracy, but I hope that you have so much support that you don't need me -- I should speak up but I feel like there are so many disasters happening to things that I care about, I can't keep up with all the things I need to protest." I told her she should just skate and enjoy the beautiful evening, and she said she would.